Aaron Baddeley - Golf's Greatest putter? Statistically speaking, Aaron Baddeley ranks as one of the greatest putters in modern-day golf. 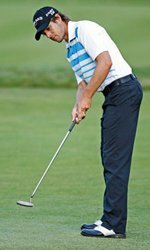 Between the start of his US PGA Tour in 2007 and 2013, he only once ranked outside the top 15 putters on the annual stats for putting and has usually been inside the top 10. Only Luke Donald and Tiger Woods come close to this consistently high level of putting. But even they don't out-putt Baddeley on the stats. With his simple, "no frills" routine and brisk putting action, he is also a great player to learn from when honing your skills on the greens. Date of birth: March 17, 1981. Claims to putting fame: Led the PGA Tour in putts per round in 2003 with an average of 27.88. 1) Read the last part of the putt first and establish where the ball will be falling into the cup. 2) Walk around the low side of the putt to help find the highest point of the break. 3) Make your practice strokes behind the ball, perpendicular to the target but looking at the hole (remember to look along the starting line of the putt, NOT on a direct line between ball and hole). 4) Address, execute and see the results! Because of this, Baddeley is clearly a feel putter who combines visualisation with a meticulous, disciplined routine. There isn't a lot to talk about on the subject of Baddeley's putter. For most of his career, he has opted for a classic shape in the form of a Scotty Cameron, with no mechanical alignment aids or groove technology. In the 2012 season Baddeley used a putter from a tiny start-up firm Yar which claimed to have the lowest (in fact zero) MOI (moment of inertia). The idea of going for the lowest possible MOI goes against the mainstream of putter design, and caused quite a bit of interest. But the Yar putter didn't stay in Aaron's bag for long and he returned to his ever-faithful Scotty Cameron soon after. We haven't yet had the chance to test the Yar, but as soon as we do, we'll let you know!